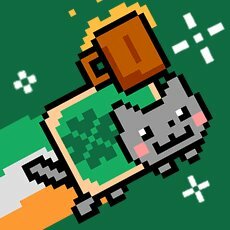 Happy Nyan St. Patrick's siku. Almost forgot to post this...I thank my friend for reminding me to not forget about the green cat!~ :3 Glücklicher Heiligen Patrick Tag alle~!. Wallpaper and background images in the Nyan Cat club tagged: green nyan cat nyan poptart cat lol poptarts nyan cat happy st. patrick's day green.